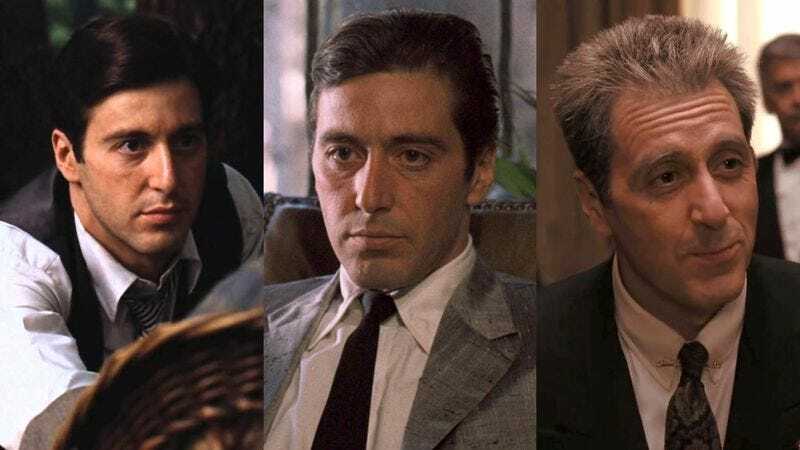 The characters pictured above are meant to be the same person and not three unrelated individuals named Michael Corleone, according to Coppola. LOS ANGELES—Saying that he always intended for the films’ events to fit into a single linear timeline, director Francis Ford Coppola revealed in an interview this week that The Godfather, The Godfather Part II, and The Godfather Part III all took place within the same narrative universe. The 74-year-old auteur explained that although each film can be appreciated as a stand-alone project, he in fact directed the movies with the conscious goal of weaving all three together into one cohesive world, dropping in subtle clues throughout to suggest that certain details and even entire story arcs within the movies were connected. Coppola said that once he conceived of the idea of placing the movies in the same universe, he made a point of theatrically hinting at the web of intersections between all three. In addition to keeping the same characters from movie to movie, Coppola noted that viewers who pay close attention can catch other continuities among the three works, from the music playing in the background, to common phrases and manners of speech, right down to the titles of the films themselves. Indeed, rather than viewing them as separate tales of organized crime in America, Coppola said he would prefer that people instead consider The Godfather, The Godfather Part II, and The Godfather Part III as a unified trilogy, or saga, portraying the story of a single Mafia family over time. Over the entire course of production, however, Coppola admitted that keeping the single interconnected world consistent became more of a challenge, especially in the third film—which he said was meant to be the “final” movie in the Godfather universe, temporally speaking—as it required viewers to make the complex logical leap of recognizing that the crime family depicted in the late 1970s was still the same crime family from the 1940s and 1950s from the earlier films. Noting that the nods to a common narrative were “Easter eggs” intended “only for the real diehards,” Coppola emphasized that the movies still held up individually, though he assured audiences that, after several viewings, many of them would pick up on details such as the fact that almost every character in the three films has ties to the Sicilian Mafia. Coppola did note, however, that Fredo Corleone from the first Godfather and Fredo Corleone from the second were supposed to be entirely different characters, and admitted that the repeated name was an error he noticed only after the film’s release.